As a member of Duke's Nicholas School group visiting Santiago to discuss environmental sustainability in Chile a few months ago, I posted the following to the Nicholas School blog. As it has received some comments, I thought I'd re-post it here, as an independent space in the blog-sphere. In 2004 and 2005, the attention of the World Wildlife Fund, the government of Chile and a local citizen group called Action Group for the Swans was turned on Chile’s Carlos Anwandter Nature Sanctuary and the Cruzes River. In question were the emissions of a new paper mill owned and operated by Arauco, Chile’s leading forestry company and supplier of 6% of the world’s wood pulp. Swans were dying by the hundreds and an intolerable smell drifted down the Cruzes River valley into the town of Valdivia. Independent analysis from WWF and the Chilean government confirmed the suspicions of the locals. Pulp mills bleaching with chlorine dioxide release dioxins and furans that are then absorbed by luchecillo and other waterweeds, a staple in the diet of the migrating black-necked swan. Though Arauco resisted the findings, the plant went through a series of voluntary and forced closings at direct and painful cost to the company profits. At the same time, a public relations war waged on. Fast forward to September 2006 when this same company wants the world to know they get it. In that month, Arauco’s Nueva Aldea pulp mill began operations as an embodiment of lessons-learned. Engaging community stakeholders at the outset and building a state-of-the-art mill whose emissions are so benign, the company added a vineyard and olive orchard next door just to prove the safety of the effected soil and water. None so righteous as the recently converted. We spoke today to Charlie Kimber, vice-president of marketing and sales for Arauco. It was clear in his characterizations of the Valdivia fiasco that he and his company had been through a powerful experience. Mr. Kimber spoke with conviction about the err of Arauco’s ways saying that “we had a very bad attitude” in dismissing the local community and their concerns. According to him, Arauco had since embraced their responsibilities as a global and local corporation. “Being global starts at home,” said the reformed executive. Still, a tinge of victim-hood remained in his tone as did hints that the company was innocent of any wrong-doings beyond their “bad attitude.” So one might fairly question whether Arauco has discovered a fully authentic sense of stewardship for the land and waters they use and the trust of communities on whom they depend for their business. What is clear is that Arauco has embraced a message of sustainability and is investing aggressively. Nueva Aldea is just one component of an overall sustainability strategy that includes an assessment of the company’s full carbon footprint including everything from source materials to processing, operations and transport of final products to their destination. Through these and similar programs, Arauco may be setting the standard for triple-bottom line sustainability amongst forestry companies in South America. Yet the court battles and controversies over other plants continue. So just how real is their new-found environmental responsibility? Moreover, to what degree do we care whether Arauco’s leaders have had a true conversion or simply responding to market pressure? 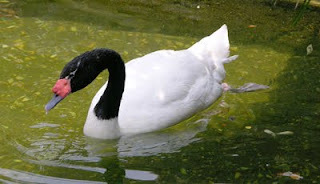 The black-neck swan is still waiting. In addition to pursuing their environmental responsibilities in the large, Arauco needs to address the damage to this bird population by sponsoring a recovery strategy in the region to create and maintain habitat. Only action matters. Aruco has yet to fully own their responsibility to the ecosystems in which they operate. Watchdog groups must stay alert to greenwashing. So long as Arauco maintains a brisk and steady march to the promised land of full sustainability with accountability, transparency, and scientific rigor along the way, we will celebrate their transformation.